Matthew Hayden, Mark Taylor, Don Bradman, Michael Clarke. That is the list of the men with the highest Test scores for Australia after a day on which Clarke not only wrote himself into the record books but also declared early enough to give his side a strong chance to push for victory over India. Clarke ended Australia's innings with his own score on 329, choosing neither to seek the glory of chasing down Brian Lara's world-record 400, nor even Taylor's iconic 334, the best score by an Australian Test captain. Instead, he chose drinks in the middle session - the halfway point of the game - to declare Australia's innings closed at 4 for 659. His partner, Michael Hussey, had just reached 150. His thinking as he and Hussey walked off to a standing ovation from the SCG crowd was clear: on a good pitch, Australia would need time to bowl India out, especially with the chance of rain on the fourth day. Personal milestones meant nothing. The team goal was all that mattered. By the close of play, Australia had two of the ten wickets they wanted. Virender Sehwag had gone in the fourth over of the innings. He flashed hard at a wide ball from Ben Hilfenhaus and was brilliantly snapped up at point by David Warner, whose split-second leap up and to his left allowed him to clasp his hands around the ball and remove India's quickest scorer for 4. Hilfenhaus also accounted for Rahul Dravid, who was bowled for the third time in the series. On 29, Dravid moved his front foot across in line with off stump but left enough of a gap for the bowler to nip a ball in between bat and pad. The Wall is in desperate need of some mortar, but don't expect the former bricklayer Hilfenhaus to supply it. At stumps, India were 2 for 114, still trailing by 354, and the Australians needed to find a way through the defences of Sachin Tendulkar, who was on 8. Unexpectedly, given his struggles in the first three innings of the series, it was Gautam Gambhir who was giving them the most trouble. He had reached 68 and was playing positively, having struck nine boundaries. Already he had his highest Test score in more than a year. However, Gambhir had been given a life on 66 when James Pattinson found his outside edge in the dying stages of the day. Brad Haddin dived to his left and for the second time in the series moved too far; the ball sailed between his arms while his gloves kept moving further towards first slip. The Australians knew it could be a costly let-off, for runs had flowed easily for Clarke and Hussey on the third day. In three hours of cricket, they added 177 for the loss of no wickets. In fact, from 4.43pm on the opening day of the match until 2.10pm on the third day, Australia had put on 622 runs for the loss of just one wicket, that of Ricky Ponting, who fell for 134 midway through the second afternoon. 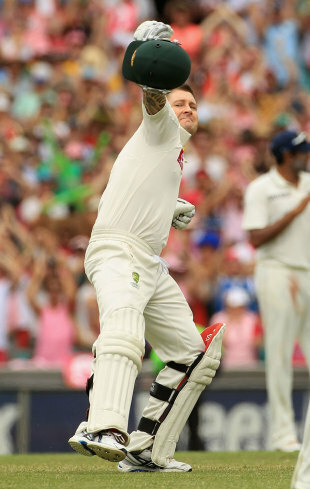 And while Hussey finished with 150 not out, the third day was all about Clarke. He not only became the sixth man to score a Test triple-century for Australia, his innings was also the best by an Australian captain in a home Test, surpassing Bradman's 270 at the MCG in 1937. It also broke Tip Foster's 108-year-old record for the highest score in an SCG Test; his 287 on debut was passed when Clarke drove a boundary through extra cover. That was a record that could not be overstated, especially in the SCG's 100th Test. Over the years, 3747 times batsmen have walked out on to the Sydney Cricket Ground to commence a Test innings. In all of those performances, nobody has ever scored as many as Clarke did over the past three days. He went to lunch on 293, and it took barely ten minutes after the break for his triple-century to arrive. It came with a flick off his pads for a boundary off Ishant Sharma, an appropriate shot for Clarke had punished anything on his legs throughout the innings. In truth, there was hardly a region of the ground in which Clarke didn't score freely: he drove through off and down the ground, cut, pulled and glanced with ease. He was slow out of the blocks on the third morning, ensuring he got himself set again, but never did his innings stagnate. He was helped by the presence of Hussey, who became the third centurion in Australia's innings. In a 334-run partnership with Clarke, Hussey kept the scoreboard ticking over at a reasonable rate. He brought up his 16th Test hundred with a single tickled towards third man off Sehwag's offspin shortly before lunch, and he pumped his fists with delight. Although it was Hussey's fifth Test century since the start of the Ashes last summer, he had also fallen for three golden ducks during his past nine innings. At no did India seriously look like breaking the partnership, although R Ashwin bowled an impressive, searching spell in the opening session. The action in the middle became so predictable that in the ABC radio commentary box Harsha Bhogle and Kerry O'Keeffe entertained listeners by challenging each other to eat the world's hottest chilli. Meanwhile, in the Channel Nine box, Ian Healy quizzed Bill Lawry on pigeon diseases. But all eyes were fixed on Clarke as he reached his triple-century, and when he declared less than an hour later. It was a captain's innings in every way, just as he delivered in Cape Town against South Africa in November. Australia lost that Test. Clarke made sure they won't lose this one.